TO ALL OF MY DARLING BLOGGING FANS IN JAPAN !! Hey! Good Morning Everyone! It is my favorite day. Blog Day. And I am here very early to write my Blog and be with you. I hope that we can have some fun together today. I just wanna find out what is happening? Between you and me, SOMETHING must be going on. Perhaps together we can find out what it is. How about starting right now? BLOG: # 107: SPRING ! WHERE IS IT? My Dear Ones and My Darlings! What I mean is, last week I wrote my Blog about Spring and that it was here and I was all happy that it showed up and I was feeling just wonderful about it because it was beautiful and just gorgeous and I was just so thrilled. Now I just want to know the answer to this question : WHERE IS IT? I mean, I am sure that by now, Spring has showed up everywhere and everyone is having a wonderful time. A time meant just for them to enjoy and have fun with family. Yeah. Like a Spring Vacation. The snow is gone after all and everyone is now getting ready for Easter and…..and….and……so where is Spring? What happened to it? Oh…..but Mary Ann-san, I can hear you all saying over there in Japan, in Chiba-Ken, Spring is here in Japan. What do you mean, where is Spring? Yes, my Dears. Where is it? I mean where is it? What happened to the Season? As you all know, I live in Hawaii. In Hilo. Where it is Summer all the time. And Spring. So…..like I keep saying…….where is it? Right now over here, it is like Spring has not even come yet. It is still cold. The last thing it is here is warm and Spring-like. It is Overcast here and wet and yesterday, our Sun didn’t even come out. What’s more is that we still have our low Winter temperatures (low 60’s). The high’s are slowly climbing, where to, I do not know, but wherever they are going, there is a cold wind following them with rain to follow that. I can tell you right now that if Spring is coming to the Islands, it certainly is not coming this weekend and maybe not even the next one. I do not know. Hilo has had Springs like this before. Like when it was supposed to be here and did not show up at all. Like it is doing now. Remaining all Winter-like. And then……jumping right into Summer when the time came. Is this really what I have to look forward to? AND A SUMMER SO HOT you would think I died and went to YOU KNOW WHERE instead of to God’s House and His Beautiful Heaven. So HOT that I have to keep the fans on 24/7. And think about my cat! NO SPRING FOR BABY PAWS !!!! 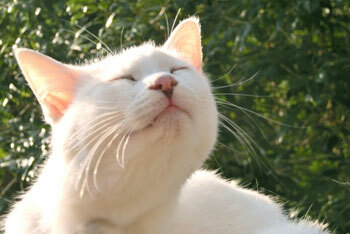 DID YOU KNOW A CAT’S REGULAR BODY TEMPERATURE IS 105 DEGREES? That is great for Winter…….BUT……. Think about THAT on a HOT SUMMER DAY! WHEN IT IS TOO HOT FOR YOU…….THINK ABOUT YOUR PETS……AND HOW HOT THEY ARE!! That is why we should definitely have Spring. It is just perfect. HILO is waiting for it……….